Funeral card. Samuel Byles. 185-. Funeral card. Samuel Byles. Coloured daguerreotype, 185-. Samuel Byles M.R.C.S., L.S.A., seated resting left elbow on arm of chair. Quarter plate tinted daguerreotype in case accompanied by funeral card of the sitter embossed with outline of tombstone. Samuel Byles was born in Henley-on-Thames on 1 January 1799, the first child of nine children of the coal merchant John Curtis Byles (1773-1853) and Bridget (1770-1829), daughter of Peter Beuzeville and Mary Griffith Meredith, both of French Huguenot descent. Peter Beuzeville (1741-1812) established a successful silk manufactory in Spitalfields, and Peter's daughter Esther (1786–1851), who married James Hewlett, and later William Copley, was a prolific fiction writer and author on social and moral issues (under the name Esther Copley). In 1822 Samuel Byles married Elizabeth Barbet (1798-1875), also of French Huguenot descent, by whom he had a daughter and two sons, one of whom, James Cotton Byles (1838-1874), also became a surgeon and general practitioner (see obituary in British medical journal, 4 July 1874, p. 24). Dr John (or James) Beuzeville Byles FRCS (1868-1964), photographer and surgeon at the Brook Hospital, Shooter's Hill, was presumably also related (see obituary in British medical journal 5 September 1964, 2: 637). 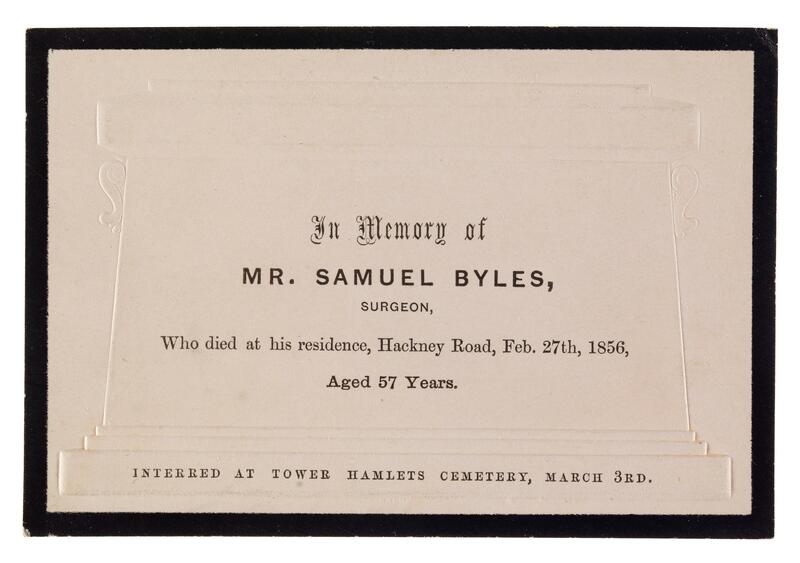 Based in Hackney Road, London, Samuel Byles practiced as a surgeon and man-midwife; was surgeon to the Hospital or Asylum for poor French Protestants and their Descendants (incorporated in 1718), and was surgeon to the Guardian Society Asylum, providing temporary asylum for prostitutes (established 1812). Working as a surgeon in this densely populated area of East London, Byles had to attend frequent cases connected with violent assault, and his name crops up in a number of murder and manslaughter cases heard at the Old Bailey where he gives key testimony, having conducted autopsies on victims. He was also concerned with public health: he identified effluvia from a nearby manure factory as the cause of disease (cholera, typhoid, gangrene) in children in the Christ Church Workhouse, belonging to the Whitechapel Union (R.D. Grainger, 'Influence of noxious effluvia on the origin and propagation of epidemic diseases', Assoc med J., 1853, 1:185). He died at 7 Philadelphia Place, Hackney Road, London, on 27 February 1856 (obituary notice in Assoc. med. J., 1 March 1856, p. 175).